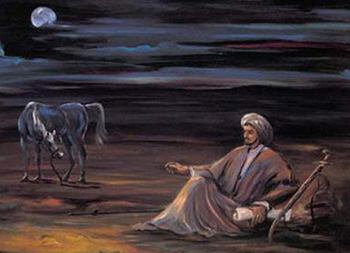 Abu Amr Jamil, the celebrated poet and the lover of Buthaina, was son of Abd Allah Ibn Mamar Ibn Subah Ibn Zabyan Ibn Hunn Ibn Rabia Ibn Haram lbn Dubba Ibn Abd Ibn Kathir Ibn ´Udhra Ibn Saad Ibn Hudaim Ibn Zaid Ibn Laith Ibn Sud Ibn Aslam Ibn Alhaf Ibn Kudaa. Jamil was one of the famous Arabian lovers: his passion for Buthaina commenced when he was a boy; on attaining manhood he sought her hand in marriage, but met with a refusal. He then composed verses in her honor and visited her secretly at Wadi ‘l-Kura, where she resided. His poetical compositions are so well known, that it is needless to quote any of them. Ibn Asakir relates, in his history of Damascus, that a person said to Jamil: “If you read the Koran, it would be more profitable for you than composing poetry;” to which Jamil replied: “There is Aris Ibn Malik who tells me that the Blessed Prophet said: ‘Wisdom comes certainly from some poetry. Taima would be where my loved one lived. Why is my love still far from me? In the ardor of my passion. And prohibitions simply make me persevere. You whose lips are my sweet source. On days I do not see your face? While my soul needs you, as still it does. “Let us have them,” he said. So that you tell me what I am to do. “What is the matter, Buthaina?” said her father. Then Buthaina went out with her women friends to the palm-trees, and I went to them with Jamil: the lovers did not separate till morning dawned, and I never saw a more virtuous meeting, nor two persons who knew so well what passed in each other’s hearts; I do not know which of the two was the more discerning. ´Udhri poetry emerges in the same early Umayyad period as Hijazi poetry and in the same northwestern Arabian province, but is named after Bani Udhra, the tribe of Jamil ibn Ma’mar, a poet of Medina (d. 82 AH/ 701CE). weep for love of his slayer, as I do? But what jihad do I want beside woman? At some periods there have been unbroken chains of illustrious poets, each one training a rawi as a bard to promote his verse and then to take over from them and continue the poetic tradition. جميل بن عبد الله بن معمر بن الحارث بن خيبري بن نهيك بن ظبيان، أبو عمرو العذري، الحجازي، الشاعر المشهور صاحب بثينة. حدث عن أنس بن مالك، ووفد على الوليد بن عبد الملك وعمر بن عبد العزيز. روى عنه محمد بن راشد الحبطي، وكثير عزة الشاعر. ذكره الجمحي في الطبقة السادسة من الاسلاميين ( 1). مات جميل بمصر سنة اثنين وثمانين. روى ابن عساكر وغيره من طرق: أن جميلا قدم مصر على عبد العزيز بن مروان يمدحه، فرآه رجل فقال له: ما رأيت في بثينة، فو الله لقد رأيتها ولو ذبح بعرقوبها طائر لا نذبح. فقال له جميل: إنك لم ترها بعيني، ولو نظرت إليها بعيني لأحببت أن تلقى الله وأنت زان. يا عباس، إني لفي آخر يوم من أيام الدنيا، وأول يوم من أيام الآخرة، لا نالتني شفاعة محمد صلى الله عليه وسلم إن كنت وضعت يدي عليها قطّ. قال: ومات رحمه الله. وقيل: إن هذه الحكاية جرت له بالشام، وفيها: إن كنت وضعت يدي عليها لريبة قط. ثم مات. وحدث هارون بن عبد الله القاضي قال: قدم جميل بن معمر مصر على عبد العزيز بن مروان ممتدحاً له، فأذن له وسمع مدائحه، وأحسن جائزته، وسأله عن حبه بثينة، فذكر وجداً فوعده في أمرها موعداً، وأمره بالمقام، وأمر له بمنزل وما يصلحه، فما أقام إلا يسيراً حتى مات هناك، وذلك في سنة اثنتين وثمانين.